Follow in your grandfather’s (muddy) footsteps and become a master farmer! This classic simulation lets you get hands-on with every aspect of farm life: from sowing crops to raising animals. The harder you work, the bigger and better your farm will become. 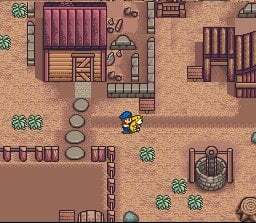 You can also visit the town to buy supplies; from food and drink to keep up your strength, to labour-saving tools for making life easier. Not *another* ESRB rated game to be excited about! It's not the most 'complete' of the series, but it's a purist's dream, and has all of the charm and addictiveness the series is renowned for. A must buy! It's the only Harvest Moon game I've actually beaten several times (with different girls). It's the very first one. And it's the best one, because it's not going forever and ever. There are many different endings, mirroring what you have accomplished in the 2 1/2 years. 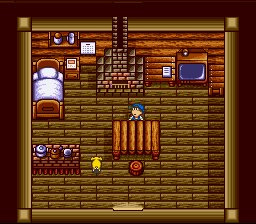 A unique and fun game on the SNES. Absolutely recommended for boys and girls who like to have their own farm. You can save on two different slots. And there were some really good musics in the game. I think I'm going to get this again. 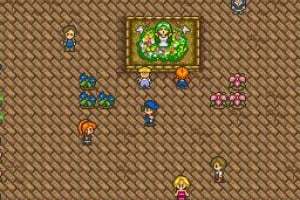 (Coz I never married that purple haired flower girl). Don't expect it to be as big and complex as the newer versions, but that's a good thing. Oh yes! I love this game. Now if they can get HM 64 that would be really great. I got to something like year 500 in that game. I have plaed many versions of this game and all off them bored me after a short peroid of time except this one. 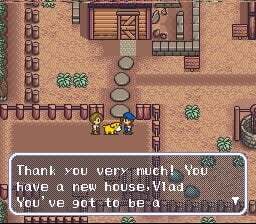 I know, when I was around 10 years old and borrow HM from my aunt and the SNES from my uncle after a long time of begging. It was in winter and I enjoyed this game soo much, because it is not as intricate as its successors with their thousands of fruits, hundreds of animals and douzens of items. It is the pure Harvest Moon, the best one to spend his time in the dark, cold months of winter. This needs to get released ASAP. I wouldn't want to miss out on this. I remember having so much fun after countless hours of Harvest Moon 64, so I'm sure the original will be right up my alley. Even if it's not as complex as the games that followed HM64, this will fit right in my collection of SNES classics. I loved that game.I really have to download this. I got a Gamecube version but wasn't impressed. "Would you recommend this to someone who played and ended up disliking Animal Crossing"
Certainly. The game is not in real time, rarely forces you to be somewhere at the right time (some festivals every now and then, but they're not that strict on how long you take to get to them), and has some more concrete goals than "get stuff and money". Plus, the game actually ends after a set period of time, so you can try to do a better job the next time. It's really nothing like AC at all. is it comming to america ??? Bass X, the Gamecube version(If you mean the Wonderful Life) wasn't much like other games on the series. 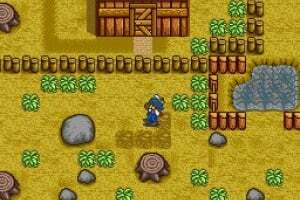 Really, I love Harvest Moon but I ended up hating the Wonderful Life. Yeah, that was my first and probably last Harvest Moon game I'll play. Can anyone confirm this for me? Is this game for boys only or can you play as a girl, as my GF really wants a new Animal Crossing experiance... but without any lesbian consequences. 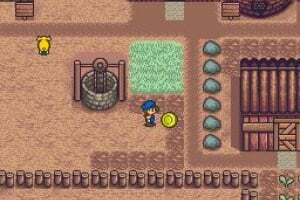 Harvest Moon is a pretty nice game, but it could be more varied. The first "year" of playing is fun, after that it´s too much repetition for my taste. A few more unique events would have made it more enjoyable. Still, it´s a simulator game that´s way more entertaining then, let´s say Sim City. 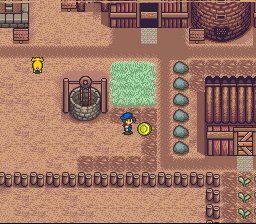 And Kalle, I guess Mineral Town is a bit more advanced than this game, so if you aren´t a really big fan of Harvest Moon you can live without this. Wow, I never realized this game simulated divorce. Look out Grand theft Auto, there is a new bad-boy in town! 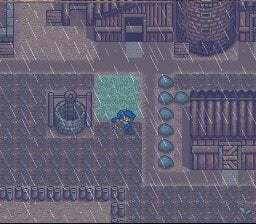 Good game but it's hard for me to really enjoy this after playing the PS1, Gameboy Advance and DS games. 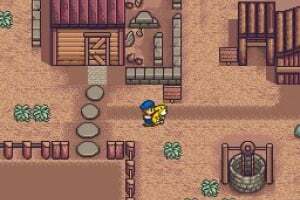 If you've never tried a Harvest Moon game before I highly reccomend you giving this a go, it's a truly great series. When is this game going to be released in the US darnit?! I never thought that growing turnips could be so addictive. I downloaded this on the PC as an emulator years ago. I was obsessed. Its a real gem of a game!! and it has so much depth. Download it NOW!!!!! Are there any games other than the Sims franchise that this is like? I'll probably buy this, but I need answers. 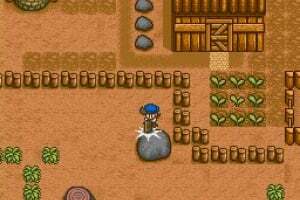 Ah Harvest Moon, A game like this really keeps you on your toes, constantly aware of what time it is, witch animals need to be fed, preparing next seasons vegetables, phew! but I must say its very rewarding if you play your cards right. Basically, a great addictive game to add to your wii menu. I haven't played HM before and I kinda wish the vid played the actual sound from the game so that I knew what the music was like as well as the gameplay. Although, I really liked FFIX. Which is better this or the N64 version? Paco-"wich is better this or the N64 version?" If you prefer better visuals and sound then the N64 version is your choice, though I actually prefer the snes version because everything just has more charm that seems to overshadow the fact that its only a 16 bit system, go for the snes version. I really want to get this game. 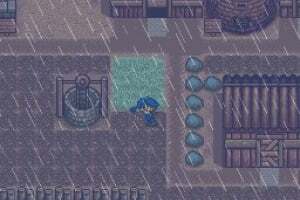 I liked the n64 version best out of all the harvest moons so far but i have always heard this one was the best. I got this the other day and started playing without any idea what was going on or how to do anything. I'm in my second autumn now and I've got piles of money and a baby coming, 10 chickens, and a pregnant cow (nine days left!). It's a great game! Now I want to get Rune Factory for the DS. I love this game and am so happy it finally got released for the VC. I have been waiting for this game since the Wii got released.I played it years ago and didn't know what to expect and fell in love with it and didn't know what I was doing. I played it on Tuesday for 5hrs without even realizing it. I never played the PS versions or HM64. But I still believe from the versions I have played that the original is the best. And I personally think that they are overreleasing Harvest Moon games now. This is one of the games I really got seriously addicted to the first time I tried it out. I've also played alot of the newer installments, but they never really captured me the way this one does. It's kind of basic, I guess, but you don't think about it when playing it. It has such charm that is hard to not fall in love with. I'd recommend this one for every fan of any simulation genre, and if you've never tried out the series before, this is an excellent place to start. I played the gameboy games and i stopped there... This can have its ups and down.. il let you decide..
LOL. I might get this once i finish a few more games. maybe a month after wiiware is released? I did NOT think I would get into this game, I am 26 years old and did not believe I'd be interested in some tamagotchi world...yet I do love nature and so on, and loved the concept, because I love gardening. So barring having a farm, and outside of the little potted herb garden on my condo patio, this game has whipped me into an "entreprenurial" frenzy and I am busy growing patches and patches of crops. I just got the sprinkler, because watering was eating up my (2 minute and 45 second) "days"! where X is a crop and O is untilled (if you tilled it, drop a fence post on it to "un-till" it and allow access to that center crop). SEE WHAT I MEAN?!? I am giving ADVICE!! Anyhow, if you want something to wile away 5 or 12 hours on per session, by all means grab this charming little game. 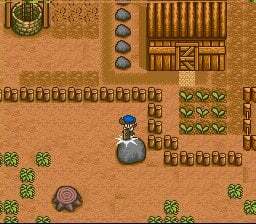 I had my first experience with Harvest Moon on that wonderful Christmas when I received Harvest Moon 64. From that point on, I was hooked. I could play the game for hours on end. 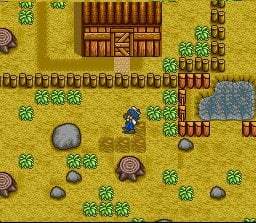 I remember one morning I woke up and played Harvest Moon 64 from the moment I got up to the time I went to bed. I was that addicted to it. Since then I've played almost every Harvest Moon game released. I still have HM64 (complete with the original box in mint condition) and I also have Harvest Moon 3 GBC, A Wonderful Life, Friends of Mineral Town, Magical Melody, and Harvest Moon DS. So, naturally, when I saw this on the Wii Shop Channel, I downloaded it in a heartbeat. 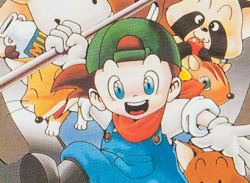 I never had a chance to really play the original (I have an SNES, but this game slipped by me unnoticed). I love this game. Everyone, do yourself a favor and download this game. 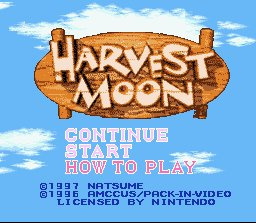 Don't pass it up just because it's a "farming sim" because Harvest Moon remains one of the most charming and original game series out there. My biggest waste of Wii Points yet, its worse than the Game Boy Colour version I've had for like a million year, the supporting characters don't give you nearly enough guidance, I don't have the time to integrate myself into washing virtual cows. Just because it's rare doesn't mean its good. This game is awesome. I really like it. Get it if you're wanting a good "relax and take it easy" game. This is one of the most creative ideas for a video game that I have ever seen! I've never felt so relax and addicted at the same time when playing a game. 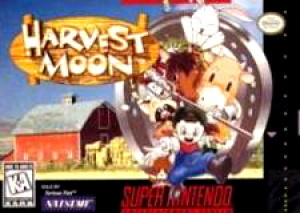 But still, this game isn't exactly for anybody, but I think Harvest Moon is a must have for any VC gamer. I'm hoping to download this tomorrow, if I come across a 2000 Points Card. I've always wanted to try a game in the series, and now I don't have any excuse not to play one. Just completed this game,pretty addictive at the beginning but as the last few days remained,got quite boring,im sure it depends on how exciting you make it, Have def spent good wii points on this tho,and wasted a helluva lot on other games unfortunately!!!!!!! I should get this game the next time i get wii points. Well actually the next time I get wii points is when i get wiiare, so maybe in the next 3 wii points cards I'll get this game. looks fun enough. 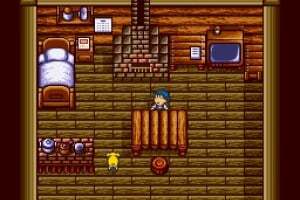 In my opinion, the best Harvest Moon game ever. Beats every single sequel ever made. Easy, a 5 stars game. 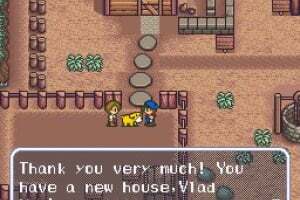 First harvest moon i've ever played, and i have to say, its a wonderful game. i think i'll get the new one that's coming out for wii. Just got it. Pretty fun. Once my farm gets going a little stronger I think it will be a lot more fun. Good purchase. Odd mix between sim farm, the sims, and an rpg. 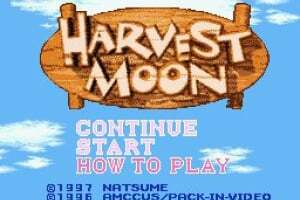 can i play harvest moon snes game in my computer...? My sister talked me into downloading this last night. I can't really say whether it's good or not yet, as I berely made any progress through the game. I guess it's pretty fun, but it sure is confusing. My sister and I spent an hour trying to figur out how to get out of that village at the start of the game (I just went on Gamefaqs and got my answer), and now I'm trying to figure out what to do w/ that stupid dog that girl gave me. This game really needs to give you better guidance. the dog is basically for show, all you do is just name it but just have patients because the game picks up and becomes easier as the game goes along. A very worthwhile download if open-ended sims is your thing. 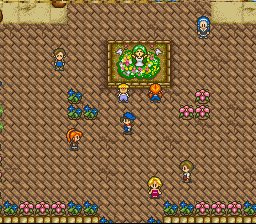 Though I prefer the new Harvest Moon games with the new features, this is a pure classic and a welcome addition to the VC. I had never heard of this game and then my friend told me about it. When he said that it was a game where you watch plants grow I looked at him like he was an idiot. I finally tried the game and I probably played for four hours and didn't get bored. I am getting this game soon. It's very fun at first, but you'll never play it for longer than ten (in-game) days without being bored. And if you don't have enough money or all your grass is gone by winter, than you basically have to literally skip the whole season. does the game end because of time? I find it addictive, but not especially thrilling. Often too much time passes without anything happening. Anyway, it's way cooler than a certain browser game that has recently come to fame.